The AHLA Pharmaceutical and Medical Device Compliance Manual includes Federal Anti-Kickback Statute and False Claims Act details as well as guidance on building your compliance program. If you are not an FDLI member and would like to purchase this book, click here. The fight against fraud and abuse in healthcare programs, and the pharmaceutical and medical devices industry in particular, continues to grow. Since 1996 the federal government has strengthened its efforts to detect and prevent fraud and abuse in healthcare, and has recovered $18 billion since 1997. These enforcement activities make a compliance program essential to protecting a company from running afoul of the myriad laws and regulations that have been enacted to combat fraud and waste. 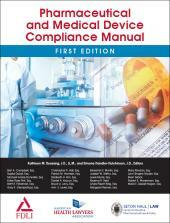 Pharmaceutical and Medical Device Compliance Manual includes guidance to help companies do that. The Manual includes guidance on building an effective compliance program and will be a great tool for health and life sciences attorneys, compliance officers, and others in the pharmaceutical and medical devices industry.